Photojournalist Nour Kelze knows that she can die anytime. The 25-year-old says that she accepts that risk to show the world the horrors that have been happening in her home country of Syria. On Oct. 23, the International Women’s Media Foundation (IWMF), a Washington-based organization that aims to strengthen women’s role in journalism, honored Kelze, Afghanistani media director Najiba Ayubi and Cambodian editor Bopha Phorn at the 2013 Courage in Journalism Awards for their bravery and determination in reporting. The IWMF also presented a lifetime achievement award to Edna Machirori, Zimbabwe’s first black woman editor. While Machirori, Ayubi, and Phorn all flew to New York to accept the awards, Kelze was unable to join. The ceremony and luncheon, attended by nearly 500 prominent US news personalities, also aimed to raise US$100,000 for an emergency fund for women journalists reporting in dangerous areas. The risks that women such as Kelze face are formidable: The Committee to Protect Journalists (CPJ) has ranked Syria as the most dangerous place for journalists in the world. Despite the risks, Kelze made the transition from elementary school teacher to photojournalist last year as her country continued to spiral into conflict. At first, Kelze worked independently, taking pictures of rebel fighters using her cell phone. A veteran war photographer for Reuters, Goran Tomasevic, noticed her talent and gut, giving her his camera equipment and training her. Before long, Kelze’s pictures bagan to appear on the pages of newspapers around the world. Kelze has escaped many near death experiences. Soldiers from a small aircraft fired at her when she was taking pictures of the aftermath of a missile attack in a residential area in Aleppo. In February, she broke her ankle after a wall fell on top of her as snipers shot at rebel fighters. She went to Turkey for an operation and was back in the field reporting four days later. In Kelze’s acceptance letter, she acknowledged the courage of the Syrian people. “I know deep in my heart there are many people who deserve this award more than I do. Syrians showed a lot of endurance and patience and courage through this crisis,” Kelze wrote. While those at the awards ceremony could only glimpse Kelze’s world through a powerful video documentary by Matthew VanDyke; Najiba Ayubi, Phorn and Machirori all took the stage and gave speeches. Following the ceremony, Ayubi could not hold back tears when remembering 11 of her colleagues who have died, saying that the acknowledgment of her work was bittersweet, considering the memory of the friends who could not be with her. Ayubi, who is the managing director of the Killid Group, a public media NGO in Afghanistan, had been criticized by state-run media for questioning the lack of independent media in the nation. Gunmen knocked on her door after she reported on a scandal involving parliament members and the secret police have told her to “be careful” because someone might be after her. She said that those challenges were “sweet” to her. “Journalism is not my job. It is my life,” Ayubi said in her acceptance speech. 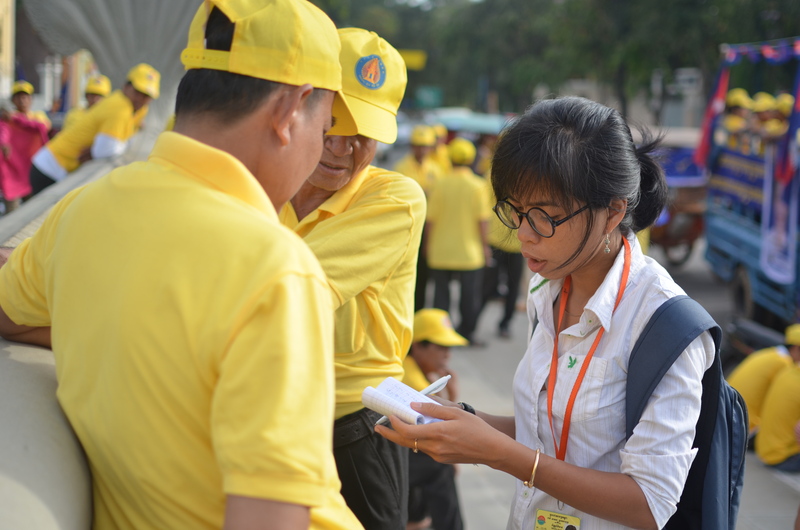 The 28-year-old Phorn has shown a similar passion for journalism, saying that it was like breathing for her. Last year, Phorn escaped death when gathering information about illegal logging in the Cambodian jungle. Environmentalist Chut Wutty was shot and killed by soldiers in uniform, while Phorn and another reporter survived. Phorn said that she thought she was about to die, and scribbled the telephone number of her editor on her stomach, just in case people found her body. Despite having nearly being killed while reporting, Phorn said that she became more determined in her work. For Machirori, who has been a journalist for 50 years, receiving the Lifetime Achievement Award was “the climax of her life”. She was the first black female editor in Zimbabwe, considered one of the most dangerous countries for journalists. “Powerful people in my country dislike being taken to task and be held accountable by male journalists, but they regard this as an attack against their personal honor and a mortal blow to their egos to have a mere woman do the same,” Machirori said in her acceptance speech. Machirori has mentored young women to become professional reporters able to navigate discrimination and sexual harassment. Her daughter Fungai has followed her footsteps. IWMF program director Nadine Hoffman said that the awards honored the work of women journalists working in dangerous areas and hoped to increase the international profiles of these women to better protect them. In the last 25 years, the Courage in Journalism Award has been given to more than 100 women from around the world. Some have been killed or imprisoned, while others have benefitted from the network provided by the IWMF, from medical assistance to pro-bono legal assistance to temporary housing. Previous recipients of the Courage Awards include Indonesian journalist Bina Bektiati in 1997; Russian journalist Anna Politkovskaya in 2002, who was gunned down in her apartment in 2006; and British journalist Marie Colvin in 2000, who died while covering the war in Syria in 2012. The writer, a former journalist for The Jakarta Post, received IWMF’s Neuffer fellowship.